Arquer Diagnostics is developing a series of innovative, non-invasive tests for cancer and recently launched ADXBLADDER, a reliable urine test for bladder cancer. Non-invasive cancer diagnostic tests could offer simpler, more reliable and less costly alternatives to current approaches, eliminating the need for invasive tests and improving the patient experience. Arquer Diagnostics is developing and delivering innovative oncology diagnostic products based on the detec­tion of a cancer biomarker, minichromosome main­tenance protein 5 (MCM5). Based in Sunderland, UK, the original company (UroSens) was founded by Nick Miller-Jones in 2005. It was relaunched in 2015 as Arquer Diagnostics, backed by £2 million in funding to drive product development and clinical trials. “Our journey has evolved from one man with a vision to a group of professionals delivering paradigm-shifting test technology,” said Whittley. The team at Arquer is supported by internationally recog­nized clinical advisors and a number of collaborators, including the International Bladder Cancer Group. In 2017, Arquer raised a further £2.1 million in series B funding led by Longwall Ventures, and launched its first product, ADXBLADDER—a simple, fast and reliable urine test for bladder cancer. A pipe­line of clinical programs is also under way, aimed at launching a series of new MCM5-based cancer diag­nostic tests over the next two years. Arquer’s proprietary diagnostic tests are based on patent-protected intellectual property licensed exclusively from Cancer Research Technology, the development and commercialization arm of Cancer Research UK. The ADXBLADDER urine test detects the presence of MCM5, which is known to be a clear indicator of bladder cancer and has been studied for more than 20 years1. MCM5 is a useful marker of bladder cancer because it is expressed by cells throughout the tumor, including tumor cells on the surface of the bladder lining, which are shed into the urine. In healthy individuals MCM5 is found only below the surface of the lining, where new cells are created, and thus rarely makes its way into the urine. The patented ADXBLADDER diagnostic uses two anti-MCM5 mouse monoclonal antibodies to detect the MCM5 antigen in urine sediment. The test can be performed in most hospital laboratories using standard enzyme-linked immunosorbent assay (ELISA) technology, which can deliver a yes or no result within three hours. Importantly, the results are unaffected by the presence of red blood cells, inflam­matory cells or bacteria. The ADXBLADDER MCM5 ELISA kit has one of the highest sensitivities and negative predictive values (NPVs) of any urine test for bladder cancer diagnosis. Results from the clinical study that underpinned the product launch were presented at a satellite sympo­sium on 21 October 2017 during the 37th Société Internationale d’Urologie (SIU) meeting in Lisbon, Portugal. The study was conducted in 577 patients who attended hematuria clinics at a number of centers in the UK between August 2016 and February 2017. Urine samples were collected for the ADXBLADDER test before the patients underwent cystoscopy and other routine assessments, including imaging tech­niques such as ultrasound. The prevalence of bladder cancer in the study population was 7.96% (n = 46), and the ADXBLADDER test had an NPV of 97%, which means there was only a 3% chance of a bladder cancer going undetected. The test also achieved a combined sensitivity of 95% in high-risk non-muscle-invasive bladder cancer and muscle-invasive bladder cancer—types of can­cer that are likely to spread more quickly and have a poorer prognosis. The overall sensitivity for the ADXBLADDER test was 76%, with correct diagnosis of 35 out of 46 cancer-positive cases. ADXBLADDER also performed better than urine cytology in the trial. In a subset of 98 samples, which included 10 cancer-positive samples, cytology correctly detected only 4 of these cancers, whereas ADXBLADDER detected 8. Current patient pathways combine different approaches to bladder cancer diagnosis and moni­toring, and there is potential for ADXBLADDER to be used at various points. For example, ADXBLADDER could replace less sensitive urine tests, such as urine cytology, and reduce the need for unnecessary cys­toscopies. There is also potential to use ADXBLADDER for regular monitoring of patients who have been treated for bladder cancer, and this approach is cur­rently under investigation. ADXBLADDER received its CE Mark on 11 October 2017 and is currently commercialized in the UK, France, Italy and Turkey. It will be released to other European countries and worldwide regions in 2018. “Meanwhile, we are continuing to drive innovation and positive change in cancer diagnostics through the development of additional MCM5 tests,” said Whittley. Arquer is also open to partnering opportunities. “We maintain a policy of active collaboration with companies, research groups and clinicians, and are interested in opportunities for in-licensing cancer biomarkers or technologies where there is a fit with our current platform and products,” said Whittley. 1 Stoeber, K. et al. J. Natl. Cancer Inst. 94, 1071–1079 (2002). 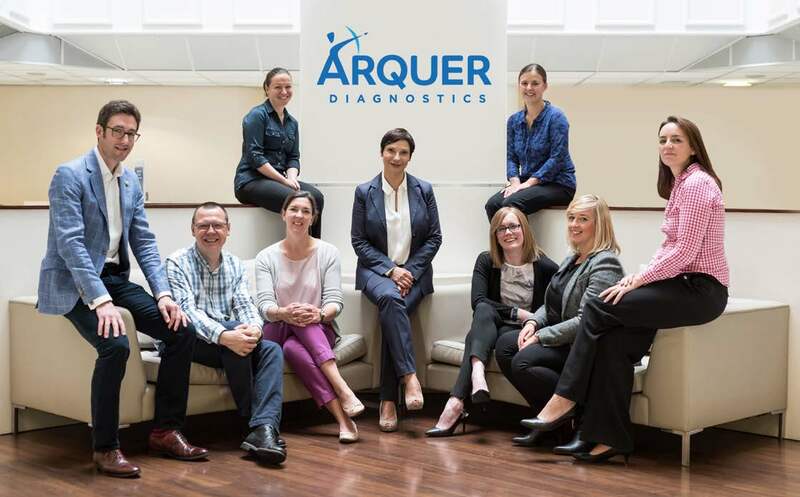 Arquer Diagnostics (Arquer) is a private, UK-based company specialising in the development of innovative, non-invasive oncological diagnostic solutions. Our vision is to inspire transformational change in the field of oncology diagnostics, through the development and commercialisation of novel assays. Passion is in our DNA, and our mission at Arquer is to leverage the years of scientific expertise, integrity and knowledge of our team to deliver cost effective, evidence-based oncology diagnostic solutions. By sequencing the MCM5 antibody, Arquer have been able to develop an exclusive, patented technology for diagnostics in bladder and prostate cancer. The Arquer MCM5 test has been studied for over 12 years – the vast majority of which was spent developing a strong assay and validating and testing the accuracy of the test. Based in Sunderland, Arquer has established itself as a centre of excellence for biotech in the North-East of England, bringing commercial growth and scientific opportunities to the area.